A couple more interesting ones today . . . .
No, they aren’t standing on ceremony. They’re using the opportunity to come after the guy who dared threaten their profitable arrangements. Who knows how widespread this kind of corruption is, but it certainly exists and those benefiting don’t want it to end. Similarly, one can only guess to what extent Serdyukov’s been successful instituting his civilian control over Defense Ministry financial flows. And no one should assume the civilian hands on these flows will be any cleaner. 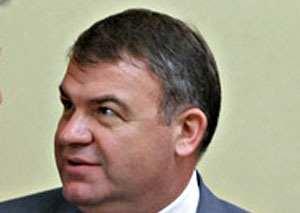 This entry was posted in Crime and Corruption, Military Leadership, Rear Services, Serdyukov's Reforms, VDV and tagged Aleksandr Golts, Anatoliy Serdyukov, Mikhail Leontyev, Oboronservis, Rosoboronpostavka. Bookmark the permalink.